EXAM TIME!! Yes, the most crucial time in your life if you have prepared a lot with complete devotion and hard work. But, just give it a thought that exam is the only mode that could reveal your hard work by presenting the results in front of you. You will be able to understand the level of your preparation and devotion to studies. CSIR NET is not the easy one to crack within the first chance. But you can definitely become the one to get over it in your first ever chance. Take your CSIR NET Preparation to the next level with Expert’s Guidance at Eduncle. Free Sign Up to get counselling for better learning!! 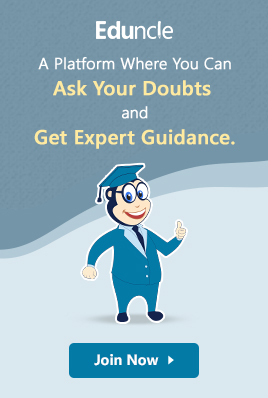 No doubt, you have done full-fledged preparation for CSIR NET Exam in your related subjects, but all your preparation will go out of purpose if you can’t handle the stress of exam in the last few days before appearing for the exam. Don’t victimize yourself with the exam stress that you cannot focus on the crucial process of revising the topics you have learned in the last few weeks. Anxiety, nervousness, confusion, fear, and excitement are some of the mixed feelings you would have as the exam date nears. The Council of Scientific & Industrial Research (CSIR) conducts the Joint CSIR-UGC Exam by keeping an aim to determine the eligibility of the Indian National candidates for the award of Junior Research Fellowships (JRF) NET and to determine the eligibility for appointment of Lecturers (NET). The fellowships under CSIR Recruitment are awarded in various subject areas that come under the faculty of Science & Technology like Life Sciences, Chemical Sciences, Earth Science, Physical Sciences and Mathematical Sciences. Here, Eduncle has come up with some important last minute tips for CSIR NET exam aspirants. 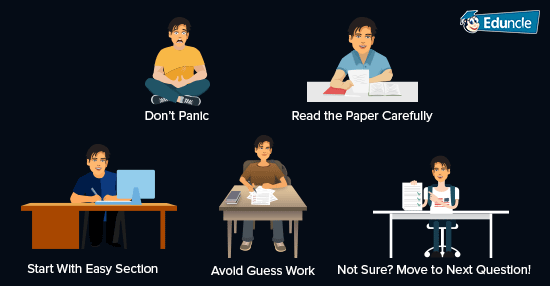 These tips will help you in getting rid of the exam stress and to attempt the paper with confidence. Every student/aspirant aiming to achieve success in exam experiences the exam stress. You can’t avoid this phase because its existence involves a reason. Now you have to choose, whether you use it as a breakdown of your confidence level or to improve your performance. In all the above cases you have to keep in mind that you have done your best while preparing for CSIR NET Exam and now it’s time to confidently attempt the paper. Show yourself that overcoming the tension and stress is all in your hand. 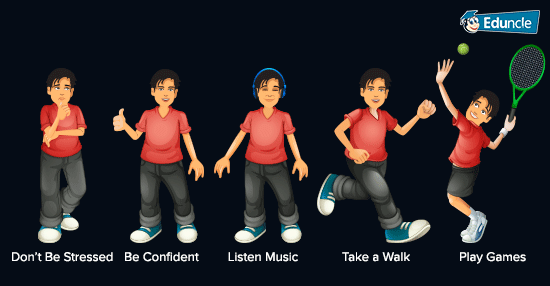 You can go for a few interesting things like listening to music (prefer classical music), walking, playing games etc. You are advised to revise your notes properly. Take help of the self-notes you had prepared while studying each topic in detail. Revising the quick note will help you memorize the whole CSIR NET Syllabus with important points. Start revising from early morning. It will help you to avoid rushing the whole day and you can easily relax at night. Avoid getting deeply involved in a single topic. Keep in mind you have already prepared it, and you are only revising. Don’t get distracted by mobile phones, TV, music, social media, games etc. at the time you start studying. It’s advisable to switch the phone off. Make sure you sit on a proper desk. Don’t start revising just sitting on the bed. Take short breaks in every one hour. If feeling tired, have a good sleep for 1-2 hour. 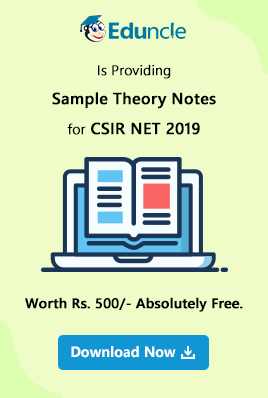 Are You in Search of Top-Notch CSIR NET Study Material? Here You can Download FREE Stuff Designed by Highly Skilled Educators. Avoid missing any of your meals. Also, say no to skipping meals. Having a proper and balanced diet is not only important but beneficial for both mind and body. 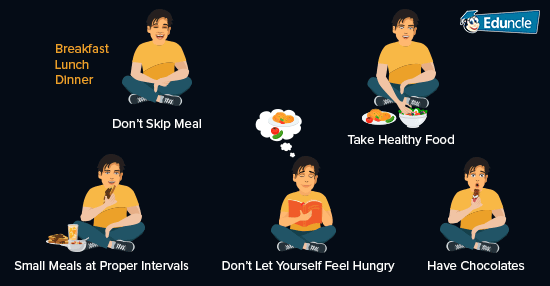 Skipping meals may result in loss of memory power. Retaining and memorizing what you have learned is very crucial. Don’t overburden your mind and body with the continuous pressure of revising everything in one go. Take revisions also with ease and gradually move ahead with the process. Have light food or healthy snacks at regular intervals. It’s better if you go for fruits. Make sure you are not feeling hungry while studying. It will hamper your level of concentration. Have chocolates to release stress. Eat light before you go to bed. Staying up all night and studying is not going to give you positive results. 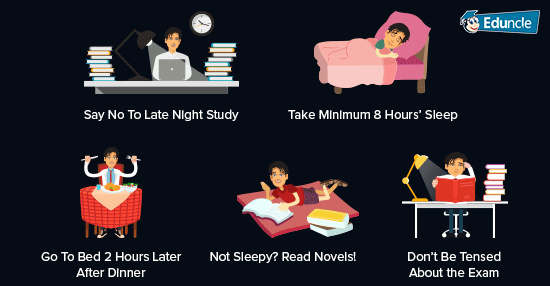 The points that you study at night might not be there in your mind at the time of the exam. Proper sleep at night before the exam is extremely necessary for relaxation. You should have at least 8 hours’ complete sleep. Make sure you take dinner 2 hours before you go to bed, otherwise the full stomach will keep you awake. If you can’t sleep, don’t go back to study. Instead, read some novel or do something other than studies. You should keep your mind calm. Now finally you are about to face the exam!! You are ready for the big day as you have prepared all important matters and revised them carefully. But the most important task is yet to be performed by you. You all know that only studying the complete syllabus will not bring success in your attempts, you will also need the confidence to improve your performance in the exam. 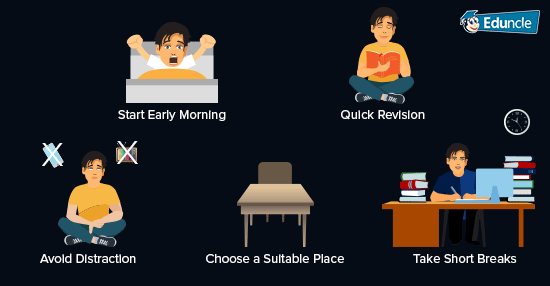 Below, we are guiding you with some simple tips that you should follow on the day of the exam and at the time of attempting the paper. Please wake up early in the morning so that you need not rush for reaching the exam center and will be able to have proper breakfast. Check your exam venue (center) and time, to avoid last minute rush and confusion. Have a good breakfast, not too much but healthy that will keep you energetic while examination. It is advised to have bananas as they are not heavy but the fiber will keep your stomach full. Check your belongings before you leave for the exam center. 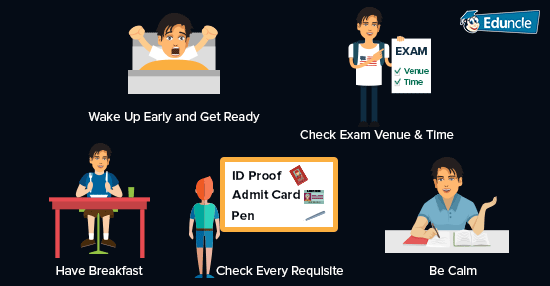 Make sure you have the admit card, ID proof and other important things that will be needed at the time of the exam. Don’t forget to wear a watch. After reaching the exam center, take a deep breath and be calm. Locate your seat with the help of the roll number. Be helpful and cooperate while the invigilator performs the necessary checks. Don’t argue unnecessarily over their questioning as it’s part of their job and follow what they instruct. Maintain your calm and concentrate on what you have learned. Boost up your preparation with Free CSIR NET Previous Years Question Papers and Mock Test Papers. Download Now! Don’t panic when exam starts. Be confident to avoid committing mistakes. The paper has three sections to attempt. Read all the section first so that you can divide the time limitation that you should give for each section. You will be given 200 questions in the paper to complete within 3 hours. Don’t worry, you need to attempt 75 questions correctly. Do not rush to attempt all the 200 questions, as the examiner will only evaluate the first 75 questions you have attempted. You are advised to start attempting the section first in which you are very confident. Kindly read and solve the questions carefully before you mark the answer. You should read the answers first and then the question. It will save your time. Because when you see the options, you automatically read the question again. So, avoid doing it twice. While attempting questions from logical reasoning, data analysis etc. please mark the answer based on logic and not on imaginations. In case, you are not provided with diagrams or graphs, draw them on your own to get the correct answer. In geometry, you may get question showing an incomplete figure and you need to answer by finding the missing part. You are advised to draw the missing part and complete the figure and then mark the answers. Many a time you will get the answer by approximation. If you got that, kindly avoid solving it completely. Don’t try any guessing work, as it could lead to the wrong attempt, this will result you with negative marking (0.25 for every wrong attempt). Don’t waste time on a single question. Skip the question if you are not sure about the answer. 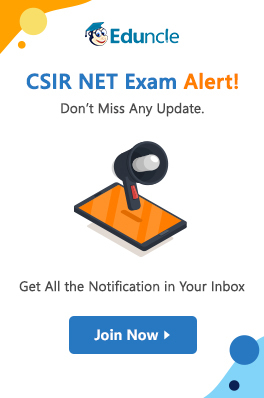 These tips will help you in performing your best in CSIR NET Exam. If you follow the above-mentioned tips, you will be able to avoid the common mistakes done by other aspirants. Eduncle also shares all the valuable insights about the Council of Scientific and Industrial Research (CSIR) and the exam conducted by the organization. Complete Syllabus in PDF format, Practice Papers, Mock Test Series!! We have Everything to Boost Your Preparation for CSIR Exam – Join Us & Grab it Now!! If you find this information worth sharing with your fellow aspirants, kindly share it. Your comments and suggestion are welcomed here. Please place them in the comment box given below.